The last quarter of the year is approaching and it’s the time of the year when the Sugarlandia of the Philippines blooms with its diverse history and culture. The province of Negros Occidental, especially the City of Bacolod, celebrates with tables filled with sugar-bowls and sweets all over the city. In line with the world renowned Masskara (many faces) Festival which is celebrated in the month of October, Bacolod City and the other chain of cities in the central part of the province offers its wide range of attractions to its visitors. Together, they make a promise of unforgettable memories with the wide range of tourist sites in the city. So join me in a quick rundown of the “must see places”, “must taste cuisines”, and “must have detours” around the area. 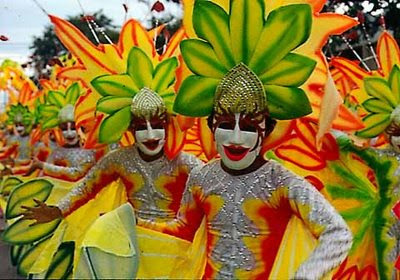 This is a Mardi Gras of dances in the streets of Bacolod happening every second to third week of October. Last time I checked they will have it on the 14th all the way up to the 21st of this year. It’s in line with the charter celebration of the capital city, Bacolod. Smiling Masks of different colors and designs are worn by dancers from different districts (barangays) of the city, accompanied by the unique and colorful costumes. The highlight of the fest is the street dancing contest where each groups dances in Latin beats. They also feature the Electric Masskara where they hold dances at night with LED lights as part of their costumes, a breathtaking event to see. 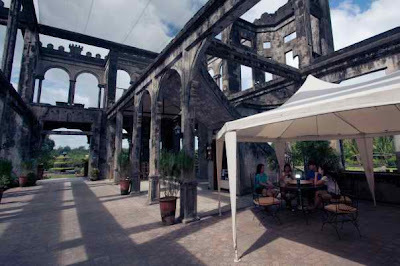 Just a ten-minute drive from the city center, you can reach this historic mansion called The Ruins in Talisay City. 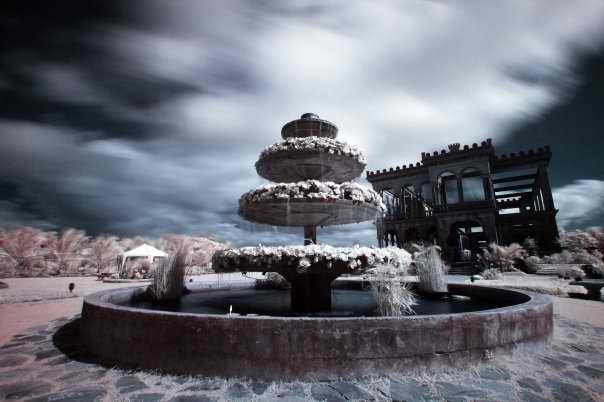 The Ruins was a residential mansion of a famous sugar baron, Don Mariano Ledesma Lacson; built in the early 1900’s for her wife and children. This historic site was burnt in the World War II by the USAFFE and Guerillas (Philippine Fighters) in order to prevent the Japanese force from making it as their headquarters. Today, the heritage site is preserved and transformed into a classy restaurant and one of the best places to have your romantic Bacolod experience at night. Being the sugar capital of the country, the city is a home local coffeeshops and cakehouses. I would definitely consider Bob’s Café since it comes with the right taste for a cheaper price. Well, you can also try the old Starbucks or Bo’s and Calea for the Pastries. You can find most of these shops along Lacson Street. 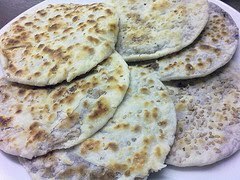 This irresistible native delicacy gives a different kind of sweet in flat and round style. It’s a brown sugar and flour blended in a way to capture the tastebuds of everyone. Grab it on the stalls of Bong-Bong’s and Merci with branches all over the city. 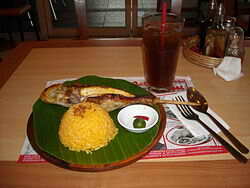 Bacolod City is also the home for Filipino-style Grilled/Sizzled Chicken. Best chicken is in Manokan Country (Manok means Chiken) which can be found near SM City Bacolod. Other local chains like Chicken Deli and Mang Inasal are quite a good competition for this small time foodshops. Right at the heart of the city, you’ll find the provincial Park and Lagoon. Aside for the city plaza, this is also one of the places that you should go if you’re looking for a landmark inside the city. It features sculptures of a woman standing alongside of a water buffalo and standing on the opposite side (south end of the lagoon) is a man pulling another water buffalo. These artworks were credited to an Italian Artist Francesco Riccardo Monti and Guillermo Tolentino. Bacolod City was once the Most Livable City in the Philippines due to the right mixture of its rural and urban zones. Now, being one of the key cities of the south, Bacolod still run in “fast-forward” in line with its development. But, the most important attraction in this place is the people. Known as the City of Smiles, it owes its good reputation to the people who still paint the smiles in their faces despite of the struggles in life.